Medusa Slots is an online video slots casino game, powered by Nextgen Gaming. As formidable the name of the game is, the visuals and sound effects are thumping as well. 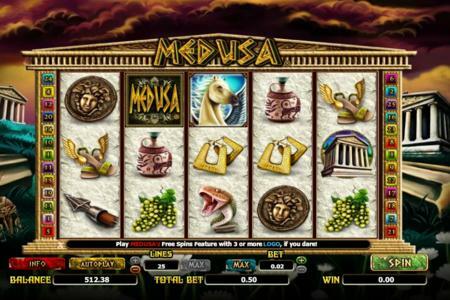 Medusa Slots is designed keeping the Greek Mythology concept in the head. The mind reels back to the historic times. This myth-inspired online casino game, being one of the best slots to play in this game genre, is widely played all over the world. It is also one of the most frequently played online casino games. Featured on Casino UK, the game is likely to enchant its European audience with its primordial and catchy aura. This casino play of Medusa Slots is a 5 reel slot game with a vivacious yet eerily sinister appearance. The game hops on Casino UK, one of the many online casino gaming websites, has 25 paylines and many additional features like scatter symbol, free spins event, random multipliers, bonuses and the highest payout of 5000 coins. The range of coins is 0.25 to 125. Medusa slots remain one of the best slots to play with the rate of return to the player is 95.41%. Play the best slots online at Casino UK! How To Face The Heathen Goddess? In Medusa Slots, be on the lookout for the fiery goddess itself, as Medusa is the wild. She is the key to fire up the Turned to Stone Re-Spin feature. The player gets three re-spins and all the wins are multiplied by three. When Medusa appears on all the three reels at once, the player gets three re-spins, with tripled rewards and expanded wild symbols. There are three-fold bonus features which make it one of the best slots to play in this genre. The first bonus is activated when the player spins to get three symbols of Pegasus on reels 2, 3 and 4. The second bonus feature is fetched when reels 2, 3 and 4 become a stacked wild symbol, triggering the three free spins. Lastly, the final bonus is gained when the Medusa symbol is received on three or more reels anywhere. The final bonus awards ten free spins with a multiplier feature of two times. Super spin is another feature which comes to life when Perseus turns up on reel 3. One to three super spins are awarded and they are banked until the free spins get exhausted. Super spins multiply the wins by 5. Apart from these bonus and free spin features, there are many other additional characteristics which make Medusa Slots one of the lucrative and best slots to play. Medusa Slots can be played from the comfort of your living room from your Smartphone or tablet. Many online casino websites now feature pay for phone bill slot games. Medusa is one of them. You may win big bucks playing Medusa via Pay by Phone Bill from £10. Medusa, infamous as a mythological Greek character depicting the spine-chilling cursed monster, was formerly known for worshipping Athena. The game revolves around the satanic female face with fixed blazing green eyes and crowned with many venomous snakes, as she is largely portrayed by the world. With the awe-inspiring and spooky graphics with the hauntingly beautiful sound effects in the background, Medusa Slots really gives a chilling sense of foreboding of daring to step into the Gorgon’s tarnished and mystical lair. The signs and symbols in the reels certainly synchronise with the mythological theme. Pegasus – the winged horse, a symbol of bonus. Medusa slots online casino game offers the option to gamble for free or by risking real stakes. Thus, battle with the ruthless goddess either way and yet still have the opportunity to bag impressive riches.